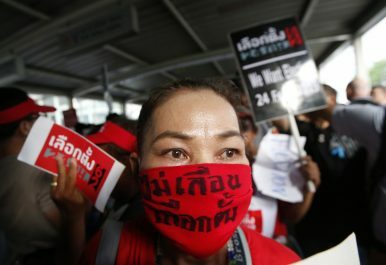 A demonstrator wears a mask translated demanding the general election not be postponed in Bangkok Tuesday, Jan. 8, 2019. Demonstrators are reacting to the possibility that the scheduled Feb. 24, 2019, general elections may be postponed. Working around the “menu of manipulation” — the tactics by which authoritarian regimes achieve a semblance of democratic legitimacy. As Thailand’s military government begins to lift restrictions on political activities in preparation for the general election later in 2019, a realignment in the political landscape is taking shape. Rivaling political parties that have long been bitter enemies have found themselves together in the opposition. Pheu Thai, a mainstream populist party and the Democrats, a center-right party, have called for constitutional reforms and voicing criticisms against the junta’s alleged interference in the Election Commission’s redrawing of electoral districts. But could the emergence of an anti-military front be sufficient enough to limit the influence of the old guard? Since the rules have been written by junta-appointed bodies, what is less important is the percent of votes the anti-military opposition obtains this election. What is key is whether the opposition would be able to exercise strategic patience and endure the long game in what appears to be an uneven structure of contestation. Thailand’s current constitution bears traces to what Andreas Schedler calls the “menu of manipulation.” These are the tactics by which authoritarian regimes achieve a semblance of democratic legitimacy while still maintaining electoral control. One lucid expression of this web of electoral credibility and electoral control lies in the transitory provisions governing the Senate. For the first five-year transitional period, the House of Representatives would consist of 500 elected members while the 250 senators would be appointed by the junta. The constitution also establishes an electoral system designed to weaken the ability of popular parties like Pheu Thai to gain a majority of seats in the lower house. Voters are allowed to cast only one ballot for their preferred party candidate in a district and party-list seats in the legislature are filled up according to the total vote shares a party receives nationwide. Additionally, this system creates pre-election coordination problems for the anti-military front. Pheu Thai and the Democrats may both oppose the military in principle, but because they not natural allies, each are are likely to focus on minimizing their electoral asymmetries instead of coordinating their candidates. If anti-military parties cannot capture at least 250 seats to control the lower house, they will have no choice but to play by the rules. Boycotting the results would likely invite repression and also allow pro-military allies to paint their opposition’s intransigence to accept the results as “undemocratic.” In the event that they do capture enough seats — a scenario that should not be ruled out given the unpopularity of military parties in Thai history — they will have the opportunity to form a coalition and push for legislative changes, including the overhaul of the constitution. During a panel discussion at Thammasat University Thanathorn Jungroongruangkit, the leader of the progressive Future Forward party, called for a post-election referendum that would pave the way for a new constitution drafted by representatives of the public. Future Forward is not alone in slamming the current constitution for its undemocratic origins. Other politicians from Pheu Thai and Democrats also amending the constitution, although their strategies differ. Aside from the challenges posed by differences in the opposition’s strategies, rushing in to hold a public referendum is easier said than done. The rules and procedures in the Amendments Section represent a Gordian Knot that any anti-military coalition has to cut through. A motion for amendment that originates from the National Assembly must pass through three stages. In the first stage alone, it must obtain at least 376 seats from members in both houses, provided that there are more than one-third of the senators in this number. There are additional pitfalls inherent in the idea of immediately triggering constitutional amendments. Pro-military parties and allies could levy accusations that the ruling coalition is amending the constitution purely for its own benefit. This scenario could invite judicial reviews by the Constitutional Court that could undermine the coalition’s cohesion in the future. Such accusations have been made in the past when the embattled government of Samak Sundaravej tried to pass constitutional amendments that would have made it harder for the Constitutional Court to dissolve political parties on grounds of electoral fraud. The enormous financial expenses of holding a new referendum would be another target. Given that the costs for the 2016 referendum was reported by the Election Commission to have reached almost 3 billion baht ($91 million), the anti-military coalition would be vulnerable to criticisms that the funds should be used for socioeconomic development. Is There a Way Out for the Opposition? Though the menu of manipulation help us identify tactics that preserve the authoritarian system’s power prior to a democratic transition, it does not mean that windows of opportunities for the opposition are permanently closed. For instance, the regular provisions governing the Senate will take effect after the transitional period. The Senate membership would be reduced from 250 to 200 members and instead of being appointed, members would be indirectly elected by and among persons of different occupational groups. This sounds like just another item in the menu of manipulation. The apparent “balkanization” of the Senate into occupational or associational representation carries some corporatist undertones in which the senators’ tacit political pact with the state may render them unaccountable to popular demands. But post-transition reforms in Taiwan and Chile suggest that the entrenchment of authoritarian legacies demand gradual, albeit strategic negotiations with reformists in these institutions. Given the previous unsavory tales of corruption among directly elected senators, orienting the Senate’s political logic toward a technocratic one could arguably limit populist tendencies among elected representatives and imbue more factual aspects intrinsic to policymaking. This means that a patient and more experienced anti-military front could make a difference in winning over Senate reformists. The notion that anti-military parties should temporarily leave the constitution in its current form is politically costly for those campaigning on the basis of removing authoritarian legacies. But given the unevenness of the playing field, exercising strategic patience gives the opposition time to convince the public that the constitution is incompatible with the needs of the country. A more experienced anti-military front, backed by wider public support, would be in a stronger position to negotiate with the Senate. Chonlawit Sirikupt is an MA candidate in Comparative Middle East Politics and Society at the Eberhard Karls Universität Tübingen in Germany.